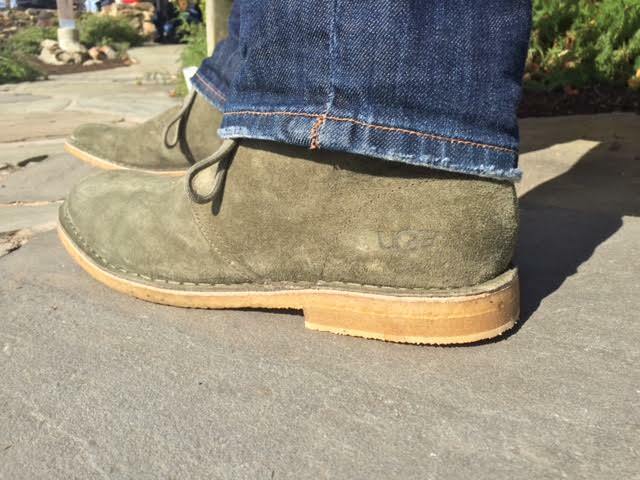 This might be one of the most obnoxious goals on the 2015 list, but dammit I wanted to own a pair of UGG shoes. Not the stupid ugly boots every girl has, but a pair of shoes for men. I have the feet of a 70-year-old (according to my doctor), so comfort is key for me. Though I’m not typically a label whore, UGGs seem like a good shoe to have given my geriatric extremities. I made my way to the Leesburg outlet mall and to my surprise, they had more shoe styles than I imagined. Straight to the clearance rack I went (though I value comfort, I value a deal even more, especially when it concerns shoes). I found green boots on sale for $50, so I bought them. The shoes are so soft inside. Like a cushion. I am a fan. Men, don’t let the ladies have all of the fun. Treat yo’ feet. Great post and shoes, I’m pretty jealous you have an outlet near you, 2 years ago I bought a pair of tan lace up boots from Ugg and it cost me around £300. Thanks for your comment. Yikes, that’s expensive!